Is this not the coolest idea?! Think of all the other possibilities! Via Johanna Hyrkas. 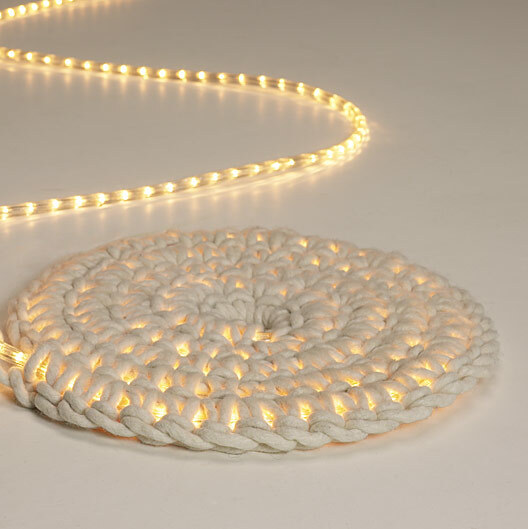 To make: Crochet around a rope light. To do this on your own I would recommend using spun wool roving like this, this or this. And cool to the touch LED rope lights like this. And use a skip knot (tying the fabric to your hook to begin), a chain (creating a ‘braid’), a slip stitch (pulling your hook through the stitch to join), and a single crochet (sc, the basic stitch in crochet). Keep the rope between the stitches. Get more instructions on how to make a rope rug from Upcycle Magazine. IE Keep in mind that rope lights are not made to be walked on so if you do this craft be sure that the rope light is ALWAYS in tact and no wires are exposed or simply use as decoration. Use at your own risk. It is safe to step on it? Wow! This looks great. Loved the idea of rope light. Thanks for sharing. Do you think it is safe to use a a wall hanging? I am thinking of hanging it amongst glow in the dark stars to represent the moon. What size is the rug and how much wool did it take? What length rope lights are used in various sizes? An 18 foot rope light would make how big of a rug? 24' rope light? 30' rope light? I wonder how warm this would get...thinking I could use it for cat bed? Oh woowww this is really awesome ! !